Convenience may come at a price for this coarse Chardonnay. 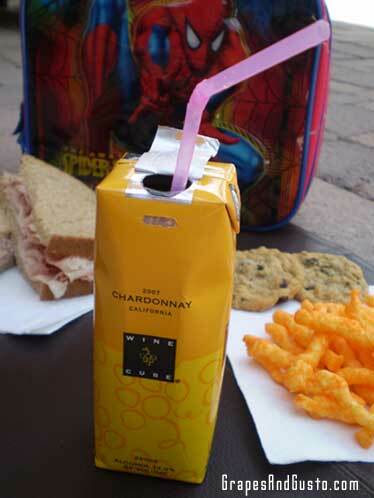 The Wine Cube by Target (the big, red retailer) may do for unfussy adults what Capri Sun and Juicy Juice did for the lunch box crowd – offer a compact way to get liquid refreshment on the go. While not advocating a literal “one for the road” message here, the Wine Cube’s compact containers include a handy-dandy 4-pack of wine “juice boxes” and come in a series of varietal flavors (“Collect all 8!”): I spotted Chardonnay, Pinot Grigio, and Cabernet Sauvignon 4-packs in the store, but according to Target’s official website, the Wine Cube also comes in Merlot, Cabernet Sauvignon/Shiraz, Australian Chardonnay (as distinct from the other Chardonnay in the series), and seasonal offerings of red and white Sangria…all in a cube (or a box, really). These may be just the ticket for convenience-minded picnic goers who would still like to pair their goat cheese baguettes with something other than bottled water. The packaging is certainly convenient – there are even Wine Cube holders, for those who want to accessorize, and the cubes themselves (lined cardboard) are stackable and unbreakable. You can take these with you to the beach, tailgate parties, or any other flask-worthy event. But here’s the rub. I tried the Chardonnay of this series, both on its own (without food first) and, to simulate an actual picnic situation, I then tried it with both a ham sandwich and with a bevy of crunchy, salty snacks (it’s a tough job, but somebody’s got to do it). While these may not be ideal wine pairings for a Chardonnay (I’d sooner pair a Riesling with the ham sandwich and some bubbly with the snacks), my experiment was to see if the Chardonnay’s general versatility would stand up to these unusual pairings, and to see if the quality of this particular wine would complement the grown-up picnic experience without going gourmet. After all, versatility is perhaps the true definition of an “all-purpose” picnic wine. The verdict? This wine was not to my liking – both on its own and with any of the paired foods. This Chardonnay lacked finesse and elegance, resulting in a bulky awkwardness on the palate and about as much subtlety as ketchup on a steak. Coarse would be an accurate descriptor. The alcohol – not the fruit – was at the forefront, causing an almost medicinal reaction in my mouth. Lest I get the Target police after me for calling their wine “medicinal,” I can only attest to trying the Chardonnay varietal of the Wine Cube thus far. Granted, this Chardonnay may be more at home with grilled chicken pasta or a turkey burger and loaded baked potatoes than with Cheetos– but if that’s the case, where do the “juice boxes” come in? Or at the very least, let’s not compromise flavor for convenience. Have any of you had a different experience with this wine? How about recommendations for other boxed wines, or other varietals in this series? 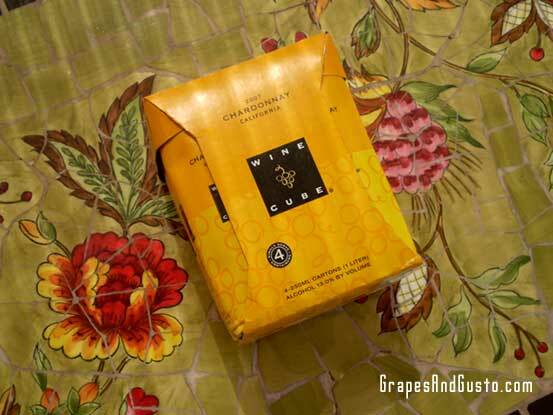 Target's Wine Cube in Chardonnay, one of several varietals in this series. Once again I am sooo glad you take on the “tough jobs”! Seriously, as a business owner and a single mom my plate is pretty full. When I have time to relax & enjoy a glass of wine, that’s just what I want to ….. enjoy it! I have come to rely on your exquisite taste, experiences and opinion to insure that I am enjoying, not experimenting with my glass of wine! Cheers to you, Gilat & your “tough job”! Thank you, Helen. You have my word that I will continue fighting the good fight, and “testing one for the team,” especially when enjoyment of our premium free time is at stake. Cheers! I agree with you about the Chardonnay and usually steer folks towards the Pinot Grigio. That one is well worth trying, especially when weight is an issue! Also, the Cab/Shiraz is a good one to try of the reds. Yes, Jennie – I definitely don’t want to be throwing out the baby with the bathwater, in terms of disparaging all of the “juice box”-style wines. I plan to try the others, including those you mentioned. Thanks for the recommendations. And Pinot Grigio is often harder to mess up. I had the pleasure of picking up the white sangria this summer to take to the beach. VERY refreshing and drinkable. It is definitely something I want in my beach bag. I just walked a Wine Cube 3-liter Pinot Grigio back to Target for a refund. While pouring the first glass, all I got was a strong smell of alcohol, no taste whatsoever of fruit, and a distinct industrial taste. Too many California wines are like this. Have found much the same taste from the grocery store Italian whites also. Bland. Nothing. Will stick to French, Spanish, Chilean whites for the best price/taste bargains.